The first episode of the second season nails down what the first season built toward: Sophie, Eliot, Hardison, and Parker are a team; Nate still think he’s better than they are. “I am not a thief,” he tells them when they try to get the gang together again, but there’s somebody in trouble and Nate’s a sucker for saving people. Nate starts off taking a straight, white collar job, but bolts at the last minute; that’s his old life and he can’t go back. He heads for a bar but is interrupted by . . .
. . . an accident right in front of him. He rescues a little girl and her father, whose car was sabotaged. 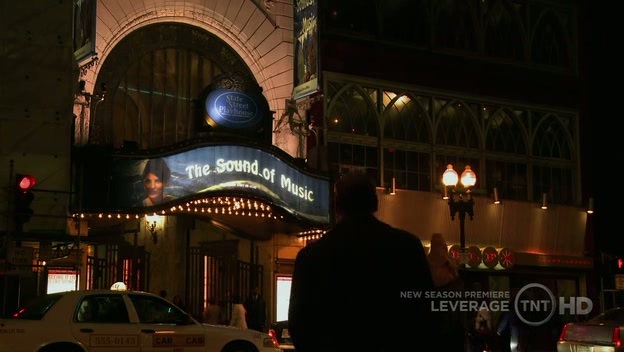 Later that night, he goes to Sophie’s debut as Maria in The Sound of Music and sees Parker, Hardison, and Eliot: Sophie invited everybody, telling them that she doesn’t sing as well as she acts, but oh well . . . When her performance is panned, the team tries to talk Nate into doing a theft to cheer her up, but he refuses, saying, “I am not a thief.” Then he goes upstairs to his condo above the bar and is attacked in his apartment. Sophie saves him and then knocks him out by accident; when he comes to, his apartment is full of the team. Change of Plans: The team finds out about the sabotaged car and investigates in spite of Nate’s refusal to get involved (“I am not a thief”), turning the plot from the story of Nate trying to go straight and sober alone, to the story of Nate protesting while the team moves into his apartment and begins to investigate. The team discovers a mob/bank scam and starts compiling intel, and as Nate looks at what they’ve gathered, he’s drawn into analysis and planning in spite of himself. Point of No Return: Nate talks himself back into the game, turning the plot from the story of Nate trying to get rid of the team to the story of Nate leading one more Robin Hood job. The team constructs a perfect con, targeting the mob boss in charge of the operation (FUSCO!) and executing it beautifully. But there’s a problem. Crisis: The mob boss isn’t in charge, it’s the banker, and their whole con is useless, turning the plot from a close-knit team executing a well-organized con to a close-knit team improvising on the fly. The team changes the plan, fakes a death, impersonates a British crime figure and two FBI agents, and sends Leary the banker off to . . . Climax: . 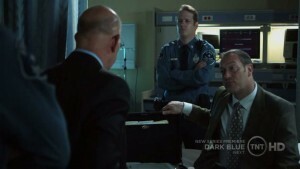 . . the hospital where he runs into the state police who discover that he’s loaded with evidence that incriminates him. Resolution: Nate agrees to keep working with the team until he finds a real job he likes enough that he’ll stay out of bars. He asks Sophie to dinner and finds out she’s dating somebody else, then walks away from a drink and goes back to his apartment where he finds Hardison turning it into a team command center. 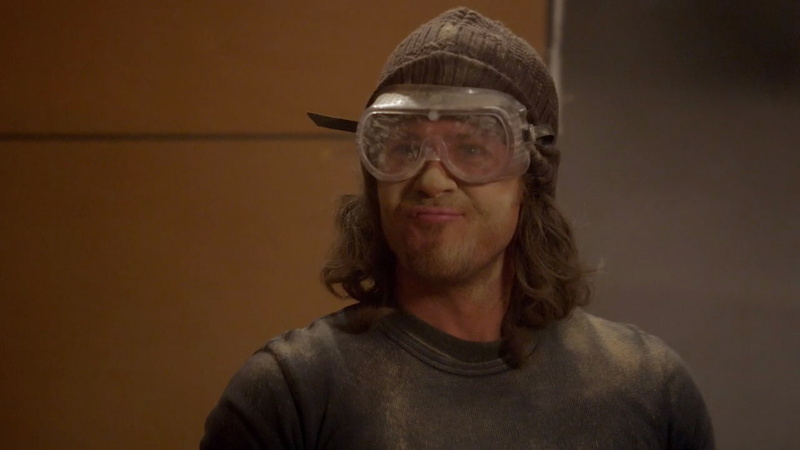 When Nate protests, Hardison explains that he bought the building as Eliot cuts a door in the wall to the next apartment. The family is home again, and the team is on for one more job, even if Mom is dating somebody who’s not Dad. This episode had to do a helluva lot: Find a plausible reason for the team to meet again (thank you, Sophie, that helps make up for the second David), find a plausible reason to team up again (they miss each other because it’s more fun as a team), find a plausible reason to drag Nate back into the team (Hey, Nate, you got any people in trouble you want to help?) and then show what all of last season was about. One way to judge the arc of a story is to look at the first scene/chapter/episode and the last, and compare the characters. The team in the first episode of the first season wasn’t even a team; they were a bunch of people hired to do a job. The same people at the beginning of this episode aren’t just a team, they’re a great team, focused, light on their feet, able to make split second changes in their plans because they trust each other and have great communication skills (and not just because of Hardison’s coms). If the promise at the end of the first episode in the first season was, “Watch these people become a team,” the promise of the first episode of the second season is “Watch what this team can do,” because once viewers/readers have watched a team form, they want to see it at work. Now if they could just keep Nate from drinking and Sophie from acting . . .
Next > Questionable: When Is A Scene Not Necessary? I get a little hit of happy when the opening pans across the Boston skyline. It has always been the capitol of my home. Or something. Think trust is a big issue in this show. Five people who have developed a lack of trust in general (part of why they are solo in the beginning) coming together to first really learn what trust means and then take the emotional risks to start trying to trust again. Not easy. And think the Sophie David episode highlights that & shows that the team comes to value trust so much that her breaking it is a big deal. But not so big a deal that they’re willing to give up on the possibility that they can have it again. Because now that they’ve experienced what it’s like to have it with people, they don’t want to live without it anymore. One of the best themes in the show for me. Always love when a theme is well explored & love here that trust is not just established than taken for granted. And that’s its valued as an essential ingredient to the team & in life. That was an especially big theme for this first season. I think it’s ironic that the biggest trust issues were with Nate (drinking) and Sophie (the Davids). Hardison and Eliot are pretty straight forward all the way through; they sometimes keeps secrets but they don’t endanger the team. Parker does endanger the team because she’s impulsive, but she learns; it’s not something she does by calculation. I think that’s why the younger three on the team bond so easily: they see each other as different but equal and play fair. Nate really does think he’s better than they are–he’s the honest man–and Sophie sees them as temporary, I think, but the Hardison, Eliot, and Parker bond. I watched the second season finale last week, and while I still think it’s a weak/confusing plot (for this show; for any other show it’d be stellar), the end always gets me, when Nate sacrifices himself for the team and tells the FBI, “I’m Nate Ford, and I’m a thief.” I think it’s ironic that he finally sees himself as a team member by conning the team into leaving as he surrenders, but it’s such a huge character arc over two seasons to get him to that point, and then another two seasons to bring him to a place of peace with himself. Your Nate comment reminds me of Maggie’s line in The Zanzibar Marketplace Job episode where she basically says: “I really like the man you’ve become–too bad you don’t.” One line, but it speaks to his journey and theirs. I also watched the season 2 ending last week, but for the first time. The plot was less about the con and more about Nate. Loved that he finally kissed Sophie. I don’t understand why he surrendered if he got rid of the evidence. Although, I don’t know if he got rid of Sterling’s evidence on the team or the evidence on Det. Lance (the gun runner). I’m also intreguied to know what line Tara spun that he’d let a friend of hers on his boat as a buyer. He wanted to bring the bad guys down. If he escaped, they did, too. The fact that he was shot and bleeding out on the pavement probably helped. Ok, so that would imply they destroyed the evidence on the gun runner. I considered the shot and bleeding thing, but that is the 3rd time Nate’s been shot in the show. In the Bank Shot Job, he was shot and bleeding and they hauled him away. And in a flashback of when he met Sophie, she shot him. Love this one. Nothing insightful to add, I just enjoy the hell out of it. One of the many things I like about it is that it has a real reversal at the crisis point. On a lot of Leverage episodes, the crisis is a crisis for the viewer but not for the team because they engineered the reversal (Victor thinking he’d discovered their plan and calling in the FBI, for example). But this time, they really did screw up not realizing the banker was the baddest guy. That as good. And now that I think about it, Leery is more their usual target than O’Hare. One of the constants for this show was going after corrupt people with money and power, that “pick up where the law leaves off” thing. Except for “Wedding Job,” they don’t seem to go after a lot of conventional organized crime types. Leery bragging about sabotaging the economy and getting away with it made him exactly their kind of mark. Throughly loving these posts on Leverage. One of my favorite moments of this episode was the gathering around Sophie just before she’s about to perform – just captured the sentiment of ‘I missed you, I am happy to see you’ for me. Plus it quickly established that at least for one night only they were all together again…. I love that scene, too. MY favorite moment there is when Sophie says she can’t sing as well as she acts, and the team has that instant moment of mutual horror, and they still go in to watch because it’s Sophie. And that’s followed by Parker, trying to be helpful which she wouldn’t have been a year before in the pilot, and the others trying to talk Nate into a job to help Sophie, which they wouldn’t have done before. 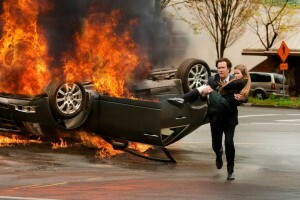 Leverage is really good at making scenes do several things at once; it’s one of the reasons the pacing is so good. I think it took them four seasons to arc the team, and I liked most of what they did. Gina Bellman’s pregnancy meant that Season Two loses Sophie for about half of the episodes, and that wasn’t good since the show is about the team, but they still did excellent stories. I think the problem with Season Five is that the arc was over, so all of Season Five feels like an epilogue, even though individual episodes were good. The finale to Season Four was fantastic, and I think that was the real finale of the show. I hadn’t seen the show before, but am catching up due to being a tad house-bound this week. These are great. I love caper plots. And watching families being built before my eyes. I was going to watch first, then catch up on the posts here for analysis, but f&#% I wish I hadn’t, because the first season arcs *were* scrambled (damn you, studio executives). Now I’m doing it show by show, checking back here for some crazy-good thinking about all that went on in the episode. Thank you, Jenny. This is fun. And should be an extra on the DVD!!! Gina Bellman was fabulous as Jane on Coupling. I’ve been in intensive TV mode (as if everybody here hasn’t already noticed that) and I’m suddenly aware of how great really tight storytelling is. Leverage never wasted a scene.